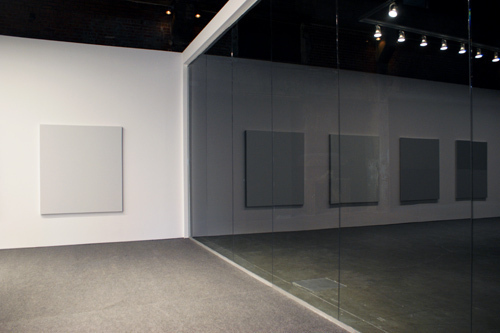 Luis Jacob, Tableaux: Pictures at an Exhibition, 2010, mixed media, dimensions variable. Installation view. Album VIII, 2009, though tucked away in the gallery’s rear space, provides a basis for the rest of the show. Readable as a left-to-right narrative, it consists of seventy-six pages, individually displayed, which use various found images to show how abstract shapes can arrange and sustain people’s lives. To begin, cornerstone Conceptual works by Carl Andre, Daniel Buren, Donald Judd, and Sol LeWitt are paired with architectural elements. On top of page four, for instance, Andre’s 144 Magnesium Square, 1969, forms a triad with Peter Eisenman and Buro Happold’s 2004 Holocaust Memorial and a commercial photo of a baby on a tiled floor. By the end, the human body, fluid and gestural, presides over these elements: Pilates practitioners interact dynamically with a network of pulleys; an illuminated urban skyline becomes a print on a man’s jacket. Viewers may wind up personifying these ideas in the main gallery’s Tableaux—a life-size, enterable white-cube space with a dozen two-tone gray paintings and one glass wall. A heterotopia not unlike a dance floor, Tableaux is both neutral and open-ended, characterized by the diverse reactions and poses of the people within it at any given moment. (A bench in front of the glass wall emphasizes the title, encouraging viewers to observe others as moving artworks.) In this respect, the adjacent “Hanna Avenue” photos, of abandoned artists’ studios in an old Toronto building set for redevelopment, provide a fitting conclusion, showing traces of creative activity in the austere, boxy industrial units that briefly provided a shelter for it.